Carbon dioxide (CO 2 ) is considered a trace gas in the atmosphere because it is much less abundant than oxygen or nitrogen. However, this trace gas plays a vital role in sustaining life on Earth and in controlling the Earth's climate by trapping heat in the atmosphere. The oceans play an important role in regulating the amount of CO 2 in the atmosphere because CO 2 can move quickly into and out of the oceans. Once in the oceans, the CO 2 no longer traps heat. CO 2 also moves quickly between the atmosphere and the land biosphere (material that is or was living on land). Of the three places where carbon is stored—atmosphere, oceans, and land biosphere—approximately 93 percent of the CO 2 is found in the oceans. The atmosphere, at about 750 petagrams of carbon (a petagram [Pg] is 10 15 grams), has the smallest amount of carbon. Marine plants and animals play a role in the uptake and release of carbon dioxide in the ocean. 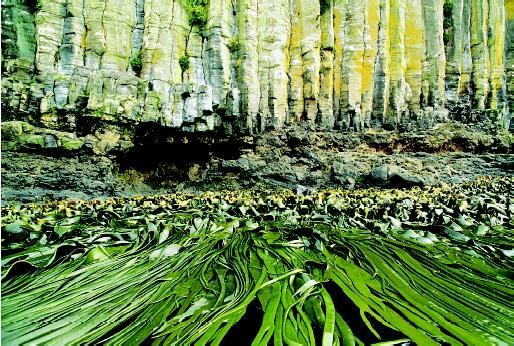 Plants, primarily phytoplankton but also macrophytes such as this seaweed, take up carbon dioxide and release oxygen, which oxygen-dependent animals need to survive. at 280 parts per million (ppm) by volume for at least 1,000 years prior to the industrial era. Atmospheric concentrations of CO 2 were constant because the carbon being removed from the atmosphere in some places exactly matched the CO 2 being added to the atmosphere in other places. Today, CO 2 concentrations in the atmosphere are increasing as a direct result of human activities such as deforestation and the burning of fossil fuels (e.g., coal and oil). Over the past 150 years, CO 2 concentrations in the atmosphere have increased by as much as 30 percent (from 280 to 370 ppm). All trees, nearly all plants from cold climates, and most agricultural crops respond to increasing atmospheric CO 2 levels by increasing the amount of CO 2 they take up for photosynthesis . It is believed that the increased uptake in land plants from rising atmospheric CO 2 levels roughly counterbalanced the CO 2 released from cutting down tropical rain forests and other agricultural practices in the decade of the 1980s. In the 1990s, the land biosphere was estimated to take up approximately 1 Pg more CO 2 than it released each year. Most of the CO 2 released from the burning of fossil fuels and other human activities (e.g., cement manufacturing) is stored either in the atmosphere or in the oceans. The CO 2 that remains in the atmosphere acts as a greenhouse gas, absorbing long-wavelength radiation (heat) in the atmosphere. CO 2 taken up by the oceans does not affect the Earth's heat balance, so an understanding of the air-sea exchange of CO 2 is an essential part of understanding the Earth's climate system and the potential impact of future CO 2 emissions. The potential for anthropogenic (human-derived) CO 2 to adversely affect the Earth's climate has resulted in attempts on the international level to regulate global CO 2 emissions. The Kyoto Protocol, for example, was designed to reduce global CO 2 emissions to 5 percent below 1990 levels. As of late 2002, the Protocol had not been ratified and global emissions have continued to rise. Global emissions in 2001 were roughly 11 percent higher than 1990 levels. The oceans contain about 50 times more CO 2 than the atmosphere and 19 times more than the land biosphere. CO 2 moves between the atmosphere and the ocean by molecular diffusion when there is a difference between CO 2 gas pressure (pCO 2 ) between the atmosphere and oceans. For example, when the atmospheric pCO 2 is higher than the surface ocean, CO 2 diffuses across the air-sea boundary into the sea water. The oceans are able to hold much more carbon than the atmosphere because most of the CO 2 that diffuses into the oceans reacts with the water to form carbonic acid and its dissociation products, bicarbonate and carbonate ions . The conversion of CO 2 gas into nongaseous forms such as carbonic acid and bicarbonate and carbonate ions effectively reduces the CO 2 gas pressure in the water, thereby allowing more diffusion from the atmosphere. The oceans are mixed much more slowly than the atmosphere, so there are large horizontal and vertical changes in CO 2 concentration. In general, tropical waters release CO 2 to the atmosphere, whereas high-latitude oceans take up CO 2 from the atmosphere. CO 2 is also about 10 percent higher in the deep ocean than at the surface. The two basic mechanisms that control the distribution of carbon in the oceans are referred to as the solubility pump and the biological pump. The solubility pump is driven by two principal factors. First, more than twice as much CO 2 can dissolve into cold polar waters than in the warm equatorial waters. As major ocean currents (e.g., the Gulf Stream) move waters from the tropics to the poles, they are cooled and can take up more CO 2 from the atmosphere. Second, the high latitude zones are also places where deep waters are formed. As the waters are cooled, they become denser and sink into the ocean's interior, taking with them the CO 2 accumulated at the surface. Another process that moves CO 2 away from the surface ocean is called the biological pump. Growth of marine plants (e.g., phytoplankton) takes CO 2 and other chemicals from sea water to make plant tissue. Microscopic marine animals, called zooplankton, eat the phytoplankton and provide the basis for the food web for all animal life in the sea. Because photosynthesis requires light, phytoplankton only grow in the nearsurface ocean, where sufficient light can penetrate. Although most of the CO 2 taken up by phytoplankton is recycled near the surface, a substantial fraction, perhaps 30 percent, sinks into the deeper waters before being converted back into CO 2 by marine bacteria. Only about 0.1 percent reaches the seafloor to be buried in the sediments. Scientists research the exchange of carbon dioxide between the atmosphere and ocean. This photograph shows the Ronald H. Brown, a research vessel of the National Oceanic and Atmospheric Administration, in the Equatorial Pacific Ocean during the GASEX II expedition in 2001. 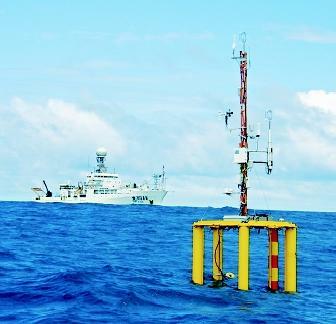 The floating instrument in the foreground measures a number of parameters associated with the transfer of CO 2 across the air–sea interface. The CO 2 that is recycled at depth is slowly carried large distances by currents to areas where the waters return to the surface (upwelling regions). When the waters regain contact with the atmosphere, the CO 2 originally taken up by the phytoplankton is returned to the atmosphere. This exchange process helps to control atmospheric CO 2 concentrations over decadal and longer time scales. The constant atmospheric CO 2 concentrations in the centuries prior to the Industrial Revolution suggest that the oceans released a small amount of CO 2 to the atmosphere to balance the carbon input from rivers. Today, this trend is reversed and the oceans must remove CO 2 added to the atmosphere from human activities, known as anthropogenic (humanderived) CO 2 . In the 1980s, the oceans removed an estimated 2.0±0.6 Pg of anthropogenic CO 2 each year. Because humans are producing CO 2 at an everincreasing rate, the average ocean removal rate increased to 2.4±0.5 Pg of carbon each year in the 1990s. The uptake of anthropogenic CO 2 by the oceans is driven by the difference in gas pressure in the atmosphere and in the oceans and by the air–sea transfer velocity. Because the pCO 2 is increasing in the atmosphere, CO 2 moves into the ocean in an attempt to balance the oceanic and atmospheric gas pressures. The mechanisms that control the speed with which the CO 2 gas can move from the atmosphere to the oceans (air–sea transfer velocity) are not well understood today. Recent technological advances are helping scientists to better understand these mechanisms. The transfer velocity is related to the surface roughness of the ocean and the wind speed. The difference in pCO 2 is related to the amount of carbon that is converted from CO 2 gas to other nongaseous carbon species in the sea water, like bicarbonate and carbonate ions. This so-called "buffer capacity" is what allows the oceans to hold so much carbon. The relative concentrations of CO 2 (1%), bicarbonate ion (91%) and carbonate ion (8%) control the acidity (pH) of the oceans. Since CO 2 is an acid gas, the uptake of anthropogenic CO 2 uses up carbonate ions and lowers the oceanic pH. The carbonate ion concentration of surface sea water will decrease by an estimated 30 percent with a doubling of atmospheric CO 2 from preindustrial levels (280 to 560 ppm). As the carbonate ion concentration decreases, the buffer capacity of the ocean and its ability to take up CO 2 from the atmosphere is reduced. Over the long term (millennial timescales), the ocean has the potential to take up approximately 85 percent of the anthropogenic CO 2 that is released to the atmosphere. As long as atmospheric CO 2 concentrations continue to rise, the oceans will continue to take up CO 2 . However, this reaction is reversible. If atmospheric CO 2 were to decrease in the future, the oceans will start releasing the accumulated anthropogenic CO 2 back out into the atmosphere. The ultimate storage place for anthropogenic CO 2 must be reactions that bind the CO 2 in a manner that is not easily reversed. Dissolution of calcium carbonate in the oceans, for example, is a long-term storage place for CO 2 . As the oceans continue to take up anthropogenic CO 2 , it will penetrate deeper into the water column, lowering the pH and making the waters more corrosive to calcium carbonate. The problem is that carbonate dissolution typically occurs in the deep ocean, well removed from the anthropogenic CO 2 taken up in the surface waters. In portions of the North Atlantic and North Pacific Oceans, however, anthropogenic CO 2 may have already penetrated deep enough to influence the dissolution of calcium carbonate in the water column. Burial of plant and animal material into the sediments can also provide long-term storage of anthropogenic CO 2 . Interestingly, almost no phytoplankton seem to grow faster in higher CO 2 environments, unlike many land plants. This is because phytoplankton growth in the oceans is generally limited by the availability of light and chemicals other than CO 2 , principally nitrogen and phosphorus but also smaller amounts of iron, zinc, and other micronutrients. One proposed approach for enhancing carbon removal from the atmosphere is to enhance phytoplankton growth by fertilizing specific regions of the ocean with a relatively inexpensive biologically limiting chemical like iron. The hypothesis is that the resulting bloom of oceanic plants would remove CO 2 from the atmosphere then transport that carbon into the deep ocean or sediments, effectively removing it from the short-term budget. The effectiveness of the "iron hypothesis" is being tested with several research efforts attempting to scale up iron fertilization experiments. Other carbon sequestration approaches, including direct injection of liquefied CO 2 into the deep ocean, are also being examined. Further research is necessary to determine whether any of these techniques will be effective or economically feasible. Implementation of these approaches may depend, in large part, on policy decisions made at national and international levels. SEE ALSO Algal Blooms in the Ocean ; Ecology, Marine ; Global Warm in and the Ocean ; Global Warming: Policy-Making ; Microbes in the Ocean ; Ocean Biogeochemistry ; Ocean Chemical Processes ; Ocean Currents ; Ocean-Floor Sediments ; Plankton ; Sea Water, Gases in . Broecker, Wallace S., and Tsung-Hung Peng. Tracers in the Sea. Palisades, NY: Eldigio Press, 1982. Falkowski, Paul G., Richard T. Barber, and Victor Smetacek. "Biogeochemical Controls and Feedbacks on Ocean Primary Production." Science 281 (1998): 200–206. Prentice, I. Colin et al. "The Carbon Cycle and Atmospheric Carbon Dioxide." In Climate Change: The Scientific Basis—Contribution of Working Group I to the Third Assessment Report of the Intergovernmental Panel on Climate Change , eds. John T. Houghton et. al., Cambridge, U.K.: Cambridge University Press, (2001):183–237. Trends Online: A Compendium of Data on Global Change Carbon Dioxide Information Analysis Center. Oak Ridge National Laboratory, U.S. Department of Energy. <http://cdiac.esd.ornl.gov/trends/trends.htm> . In 1997, a United Nations meeting was held in Kyoto, Japan to establish legally binding commitments for reducing future emissions of CO 2 and other greenhouse gases. The goal was for each member country to commit to reducing emissions to 5 percent below 1990 levels by the period 2008–2012. The timeframe 2008–2012 was set for compliance so that member nations could transition to efficient loweremitting carbon technologies. The Kyoto Protocols will not be binding until 3 months after they have been ratified by at least 55 member nations, including a sufficient number of the developed countries so as to account for 55 percent of the 1990 global emissions. Hey, i really like your page it has really helped me out for a school project. We are doing a presentation on how to remove one billion tonnes of CO2 from the atmosphere for a contest that has a prise of 25 million. So what you are saying is that cold water can contain more CO2 then warm water ? Right ? yes/no ? If the core of the earth is getting warmer due to increase in the nueclear processes in the core, that heat would be transmitted into the water and deep water would be warmed up by, say 1 degree, that would result in incresed atmospherc CO2 ? 1. How definite is it that humans are causing the global warming? I'm working on a research right now, and it shows that the CO2 emission from falling leafs, Animals, volcanoes and oceans are much greater than all man made emissions. 2. Is there a global warming at all or is it just a normal cycle of earths climate? My research and many others like mine, shows evidence of warmer earth surface but not the atmosphere on all layers. Meaning the ground is warmer but not the air. Shouldn’t there be some kind of warming happening in the air due to the "green house effect"? Like to hear your thoughts as it all seems to me and like propaganda with a larger agenda. As the oceans warm, the CO2 will be expelled into the atmosphere.As noted in article, the the oceans are such large pools of CO2, that the atmosphere's small amounts do not drive the carbon content of earth. In the atmosphere, 200 ppm or less will absorb almost all the radiation that is available. So,adding more CO2 to the atmosphere will absorb less and less radiation. By the way, there is NO RESEARCH that links antropogenic CO2 directly to global warming. James has pointed out a critical detail that is never really addressed. That is, adding increasing amounts of CO2 will not result in a continued and increasing warming of the earth. This is due to the absorption of long-wave infrared radiation no longer being linearly proportional to CO2 concentration past a certain level. Adding increasing amounts of CO2 then produces less and less of a resulting effect, similar to the law of diminishing returns. Once CO2 rises to a saturation point, just like many chemical and physical reactions, it will no longer produce any additional effect. It will reach a steady-state or equilibrium condition that is stable and the resulting effect (warming) no longer occurs. This situation with respect to atmospheric CO2 was known by the late 1970's. Comments #5 and #6 are untruthful and misleading. There is a plethora of research linking CO2 to global warming. The physics is clear. Willful disregard of current research gives rise to the erroneous conclusion of comment #6. Increases in atmospheric CO2 will lead to more atmospheric warming as infrared energy is absorbed in the wings of the 15 micron bend band of the CO2 molecule. Atmospheric CO2 is NOT saturated with IR radiation. Unabated emissions of fossil fuel CO2 will lead to dangerous climate change. I have to agree with comment #7 that manmade global warming is well-established. #5 would be correct to say that the CO2 and water in the air already absorb most of the infrared radiation coming *in* from the sun. But the Earth re-emits radiation at lower wavelengths (because the Earth is cooler than the sun), and these lower bands for outgoing radiation are not "saturated". This is why it was nicknamed a "greenhouse" effect, as it doesn't capture more incoming energy, only decreases the amount of energy that escapes. The study of the ice core samples showed that temperature does NOT go up with increasing CO2 in the atmosphare, but that CO2 goes up with increasing temperature. The reason for that was that increasing temperature will warm up the ocean, and the ocean will the release more CO2. So if anyone can tell me how the few % of CO2 that humans are responsible for, is causing global warming, then please tell me. remi, I read that the atmospheric [CO2] was much higher [4,000 ppm] a long long time ago yet the temperature was the about the same as today. If CO2 moves easily between the air and the oceans perhaps it is air temperature that is driving the CO2 out of the oceans thus increasing [CO2]? Oh wait, that can't be true since to believe it we would mean spending trillions of dollars to lower [CO2] would be a waste of money and we all know that the United Nations would never waste other peoples' money. I love the article and I still need to know the number count what is the amount of carbon dioxide in the ocean water now. The Global warming is caused by all factors including the over use of fertilization, because it has nitrogen oxide added to the mix plus the use of dead organism. This is causing our ground water to be contaminated and people are facing cancer at enormous rates. The food is spoiling faster because of the over use of deep fertilization. If CO2 levels rise, and plants, algae etc consume the CO2 and grow/reproduce/multiply in numbers, then the logical and rather simple solution is to put our efforts (globally speaking) into algae farms, coral farms (symbiotic algae in tissue) and phytoplankton farms. Nature will correct itself eventually, however, it would be in our best interest to help speed it along. Maybe floating algae farms in the openness of the pacific? It would be interesting to see how much co2 marine plant life can consume per day. I would also guess that pollution -from ships and runoff- has a larger negative impact on both plant and marine life than slowly rising levels of CO2. why is the carbon dioxide found in trace amounts in the atmosphere?